Bring your winter-worn borders back to life and get them off to a flying start with this wonderful collection of Senetti! 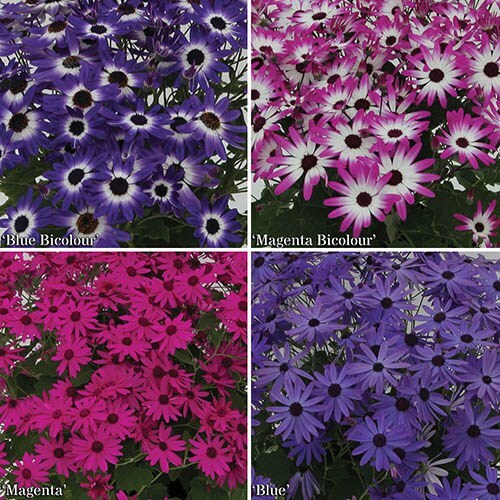 Senetti are a fairly new variety, related to Cineraria, but having much greater cold tolerance than them - they are great for planting out earlier as they will take temperatures down to zero. Coming into flower earlier than many Summer bedding lines, thanks to their ability to cope with the cold, these brightly coloured beauties will continue to flower prolifically from early April right through to hot Summer, filling a nice early season gap! With their gorgeous shades of magenta pink and deep blue, as well as their variants with a lovely two-tone white picotee, you will get prolific displays - perfect in patio pots and tubs. Supplied as a pack of 12 jumbo plugs (2.5 - 3.5cm diameter), ready to plant. 3 each of the varieties shown. Will grow to 30-45cm.